In the US we are in the midst of the presidential primaries. The presumptive republican nominee Mitt Romney is slimy and has no base of interest from the people. At such a dire time for his momentum new revelations come out about Obama. In an effort to divide and get right leaning people to forcibly back Romney they come out with this new found Obama promotional that says he was born in Kenya. In the US it is a really big constitutional issue that the presidential candidate be a natural born citizen. Many on the right think he is not. This media spectacle is to stir those emotions and bond respective people to their parties regardless if their candidate is strange and no different than Obama. Right or left no one really knows who Obama is. He came to us through spontaneous generation. Here is how ABC News played the story. Its really impossible to know the extent of the fakery. 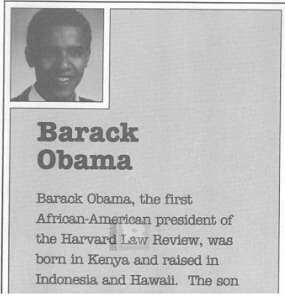 "Obama's former literary agency misidentified his birthplace as Kenya while trying to promote the then-Harvard Law grad as an author in 1991." "According to a promotional booklet produced by the agency, Acton & Dystel, to showcase its roster of writers, Obama was "born in Kenya and raised in Indonesia and Hawaii." We now know that his mother was called Stanley, so the truth is unravelling. Have you seen Webster Tarpley's book Barack H. Obama: The Unauthorized Biography? The video absolutely fascinates me, as it contains masses of curiousities...in addition to the orb, the bird, and the footless/leg-slice segments. At approximately 1min10secs, the upper surfaces of his hands flash black...no, black, symmetrically, for about half-a-second. Watch the actual imbedded video (my anima-gif isn't clear enough, plus I can't remove the watermark). Can someone else do a better job? I keep coming back to this strange video...more observations to follow. Also...note the impossibly-wide upper section of red and blue on the still US flag, centre-frame. Game_Over, you were going to do some analysis, what did you find? At approximately 1min10secs, the upper sufaces of his hands flash black...no, black, symmetrically, for about half-a-second. Watch the actual imbedded video (my anima-gif isn't clear enough, plus I can't remove the watermark). Here you are icarusinbound nice spot. The following Linux commands using ffmpeg, imagemagick and gifsicle will retrieve a youtube video and produce an animated GIF. Lots of tweak options in there.. The animated GIF can be created at the original video size (1280x720) but even for a few milliseconds of animation the file size is still vast. Also, there are various compression options, colormap merges, reductions, etc. The frame delay can be changed to slow-motion it. EDIT: The CGI software has evidently borked to blacken "Obama's" hands. The addition of gesticulating hands is a theme common to other CGI videos..
See the recently released CGI video of 911 vicsim "Graham Berkeley" and the 7/7 perpsim video of "Mohammad Sidique Khan"
In those CGI'ed videos, again we can see that the gesticulating hands are not visibly connected to the rest of the CGI'ed torso. Presumably the logic in adding hands is to create a subliminal distraction. The motion of the hands captivates the viewer, drawing his eyes away from the imperfect computer-generated facial expressions and movements. Also a bit of pointless finger-twiddling serves to counterbalance the rigidity in the rest of the frame. reichstag fireman wrote: We now know that his mother was called Stanley, so the truth is unravelling. Simon, I do think so...and ideally not something that can be dismissed by apologists as a common processing artifact. Following the scene walk-through from the background (note the total absence of any shadowing or foot-fall below the chassis/wheel-wells of the left-hand truck, as Obama enters and exits behind it), the narrative is delivered from four totally-distinct layers: (1)the dual microphones, (2)the disembodied hands, (3)Obama, and (4)the now totally-pastel/2-D backdrop (proven as solid, of course, because Mr President has walked through it). The hands are hypnotic...there seems to be a lot of reused gesture sequences (I'll come back to that), but even more revealing than the chops, sweeps, pinches and open-palmed come-with-me waves are what I'll call overclasps-and-falls. In an overclasp, the hands meet together too fast, and too symmetrically. There is a strong suggestion that the left and right hand movements during an overclasp are simply mirror-imaged (and that's irrespective of strobing effects as a result of optical aliasing between fingers/hands and the microphone frame). The hands meet too quickly, fall too rapidly, and are able to travel further towards/into each-other than seems anatomically possible. Examples of this are at 2.59, 4.16.500 (which is where I've made my poor attempt at a GIF), also at 4.27, and certainly at the strange 'blackback hand' sequence itself. Although it's currently beyond my skills to create the GIFs for this, I believe many of the hand gestures are reused. Whilst any real human talking (even non-Italians) will closely-repeat gestures during a practiced speech, there is compartmentalised unrealism about the hand movements in this video. I'm tempted to try and create multiple wirebox frames as boundary boxes, to see if e.g. the multiple "L-shaped" hand-scoops occur within exactly the same 2D space...because I feel they do. Please, those with more skills, try an initial test of this theory (reichstag fireman, that looks like some seriously-cool hot code you have there...keep your strength up, and your eyes as sharp as they seem to be). Thanks also to others that have pitched-in on this. And although I've now mislaid the point at which I spotted it, I'm convinced I saw that Obama's wedding band/gold ring on his left hand again has that weird 'split' in it, previously mentioned in this thread. - At one stage, we see BO's left hand casting a shadow on his lower chest. Shouldn't the two mikes cast their shadow too? - We can also see some blue patches flickering on his sleeves (bottom left and right). To be sure, these are common problems in bluescreening. Now, I'm not saying we are in the presence of a simple blue-screen job here - but I thought it was worth mentioning. What specifically has Tarpley said that's obviously untrue? Last edited by reichstag fireman on Tue May 22, 2012 11:22 pm, edited 1 time in total. reichstag fireman wrote: What specifically has Tarpley said that's obviously untrue? Did you have a chance/misfortune to read this idiocy ? I had and even "bought" it but it was before I found out about Septemberclues documentary and this forum. Tarpley is a liar and a schill , I am surprised that you can divide your cognitive energy between this forum and its research and Tarpleys of this world . I don't believe you read his book on 9/11 and still have some doubts in your head . Webster is a very appealing , charismatic and a very well educated person . I must give him that . But it makes him even more deceitful . bostonterrierowner wrote: [Tarpley's book 911: Synthetic Terror] Everything is there : 19 hijackers , Osama bin Laden , Al-Qaida and the expression I love : Terror drill flipped live . True. You're completely correct. With the benefit of hindsight, Synthetic Terror is unmitigated crud. Apologies for mentioning Tarpley in such an important thread. To return to the topic of Obama.. There's another video sleight of hand to add realism that's perhaps worthy of note.. In the CGI footage, the 'camera' pans very slowly horizontally - just a couple of pixels every few seconds. It becomes evident from looping a GIF animation.